Back in 1989, I visited Wal-Mart’s headquarters in Bentonville, Arkansas. As a young grad just out of the Kellogg School of Management and brand manager at Pfizer, I was mesmerized by the emerging corporate giant, and admired the huge stores, since we had nothing like them in New York, and I was stunned by their incredibly low prices. Until recently, I haven't given much thought to Wal-Mart. I was happy to put Wal-Mart in my rear view mirror after what seemed to be an endless task to fulfill a gigantic custom order of Barbasol shave cream that was shrink-wrapped by hand in 3-can value packs -- we didn't have shrink wrap on the assembly line -- and at a huge cost to the company. Why did Pfizer fill this custom order for just a few pennies profit per can? Because, back then, Wal-Mart represented about one-fifth of the consumer division's sales and to lose shelf space at Wal-Mart would have undoubtedly been the catalyst for the demise of the division's more profitable brands (Ben-Gay, Visine, Plax, Barbosol). Wal-Mart wanted 3-packs of shave cream and so they got them. Wal-Mart’s squeeze on the supply chain, including gigantic consumer packaged goods manufacturers, is well documented, as is its predatory pricing, and reputation for depressed wages, poor labor practices and anti-union stance. Studies show that Wal-Mart, with its fiercely competitive business practices, is responsible for the closure of hundreds of thousands of stores in rural and urban communities. And its 1.4 million employees, representing 1% of the nation's employment, are the largest user of entitlement benefits such as Medicaid, Food Stamps, and housing subsidies, as many of Wal-Mart’s employees have become “the working poor” and live at or below the poverty line due to low wages. 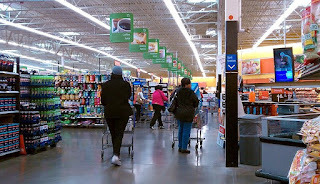 Wal-Mart is also known for creating jobs, its "everyday" low prices, including for groceries, and generous philanthropy. Wal-Mart is back on my radar. One reason is that Wal-Mart wants to open stores throughout New York City and has been in the local papers. And, the other is food. Wal-Mart’s growth strategy, now that it has saturated the rural and suburban markets across the US with its more than 3,800 stores, is to expand into urban areas, such as Chicago, Washington DC and New York, specifically in areas Wal-Mart executives have identified as "food deserts". Also recently, Wal-Mart has wandered into my neck of the woods -- the locavore movement -- and promised to buy more "locally grown" food from sustainable farms. In partnership with Michelle Obama, Wal-Mart has made strides in its long-term goal to significantly reduce the sodium and sugar in hundreds of its own and its supplier’s food products. I have to admit my head is spinning. 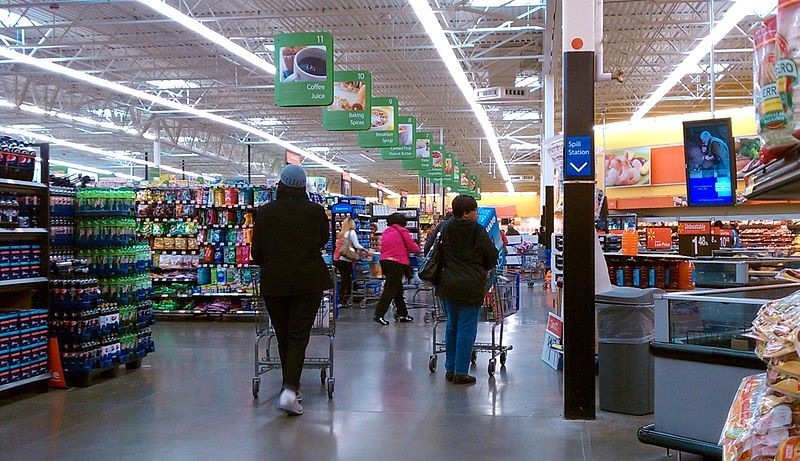 With its groceries priced at an average of 15% less than most stores for many of its products, might Wal-Mart be the answer to “food deserts” in our low income neighborhoods? Is it good that Wal-Mart is buying food from local farmers and promoting organics as Corby Kummer, who I admire, persuasively suggests in The Atlantic Monthly . Or, is this just a public relations ploy by Wal-Mart to “greenwash” their role in the rapid globalization of the food supply, while they continue to squeeze suppliers which results in the exportation of food production and processing overseas in the same way they forced American manufacturers to export manufacturing to China where labor is uber cheap? Will local NY area farmers benefit from Wal-Mart’s pledge to buy a billion dollars in locally grown produce or will they struggle even more financially due to Wal-Mart’s efforts to turn New York State's diverse fruits, vegetables and dairy products into "cheap food", just another consumer packaged goods commodity with razor thin margins like shave cream? What will happen to the tens of thousands of ethnic grocers, bodegas and independently owned supermarkets that are rooted in communities and neighborhoods throughout New York that Manhattan Borough President Scott Stringer predicts won't survive the “Walmartization” of New York? Or, the hundreds of local and healthy community food initiatives (emphasis on the word community)? With food sales estimated at over $125 billion per year, in just over 20 years Wal-Mart has 20-25% market share of all grocery sales in the US (over 50% share in 29 US markets). Do we want this kind of control of NYC's food system to go to one company -- which buys food direct from its suppliers, including local farmers -- particularly as NYC is about to invest millions of dollars in taxpayer money to modernize the Hunts Point Wholesale Food Market? Isn't it a good thing they are taking unhealthy ingredients, sodium and sugar, out of the food system, including demanding its suppliers to change their formulas at a tremendous cost to the suppliers? I applaud aspects of Walmart's "GREAT FOR YOU" initiative. But, what does the US Department of Justice have to say about some of the high-cost demands by Wal-Mart on its suppliers, suppliers that have become dependent on Wal-Mart? Will our federal antitrust laws protect New Yorker from Wal-Mart’s monopolistic and anti-competitive behaviors before it achieves 50% share of NYC’s grocery sales? How can the City rationalize keeping out Wal-Mart, when other big box stores have moved in and there are plenty of areas already zoned for large format retailers? Is there a justifiable argument that the "Walmartization" of the City will reduce tax revenue as a result of grocery workers labor unions being forced to renegotiate contracts to compete with anti-union Wal-Mart, which pays workers half of what union stores pay, or risk their supermarket employer’s bankruptcy? Can the City demonstrate lower tax revenue due to the inevitable closure of thousands of small, locally owned stores when Wal-Mart "blankets" the City with a projected 159 Superstore food outlets in five boroughs? Or, will we have to rely on anti-Wal-Mart publicity and press conferences at Manhattan’s City Hall to keep Wal-Mart away? If Wal-Mart is inevitable, can New York’s unions negotiate with Wal-Mart to hire union labor? What can and should the City and State be doing to ensure our community’s downtown’s small stores selling fresh foods, farmers markets and community supported agriculture not only survive but remain an important part of the local fabric of our diverse City? If Wal-Mart moved in to New York, I'd like to think it wouldn't affect my life much. I'd still be able to buy my food direct from farmers and fisherman (or so I hope). So why do I care? 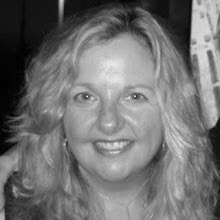 No longer a consumer products brand manager, now I am a food systems advocate and blogger for Lightheated Locavore and The Daily Meal. I advocate for affordable, fresh, healthy and local food. I support community food and public health initiatives such as community supported agriculture (I'm a member of Chubby Bunny on West End Avenue and support Just Food), farm-to-school, and farmers market nutrition program for low income families, and believe the anti-obesity public health campaigns, such as NYC's portion control and Michelle Obama's Let's Move/Chefs Move to School , are all hugely beneficial and brilliant. While some want to write off the locavore, slow food and good food movements as being "elitist", I believe there's a huge risk in ignoring the hard work and accomplishments that food advocates, neighborhood leaders and government agencies have had with local food and healthy food initiatives. There are some incredible community-supported and entrepreneurial initiatives going on, many in low income neighborhoods and not just in wealthy southern Manhattan, as well as public health campaigns. There are programs and business models that support farmers, help conserve farmland, connect rural farmers with urban markets, promote rooftop and urban farms, and improve the health of people in low income areas, particularly NYC's school food and after-school programs. There's an explosive growth of farmers markets and community support agriculture in all five boroughs. The recent focus in the media on the diet-related disease and the childhood obesity epidemic has accelerated these community food efforts, and funding, and underscored the importance of understanding the food system and connecting people, particularly children, with agriculture and "scratch" cooking. So have books and movies written and produced by former New Yorkers, such as Michael Pollan's "Omnivores Dilemma" and Eric Schlosser's "Fast Food Nation" and "Food Inc." which help connect the dots between the food system and disease, unfair labor practices and destruction of the environment for millions of readers and fans. A new book, “The American Way of Eating: Undercover at Wal-Mart, Applebee’s, Farm Fields and the Dinner Table” by Brooklynite Tracy McMillan, who worked in Wal-Mart’s produce department at a store near Flint, Michigan, was reviewed in yesterday’s New York Times Book Review. McMillan is critical of the way Wal-Mart manages its produce department (thanks Mom for directing me to the review). The Times reviewer, Dwight Garner writes, “The produce sold at the Walmart where she works is second-rate, often slimy, mushy or merely bland. “Walmart doesn’t always have the freshest stuff,” one manager says to her. “That’s how we keep the prices low.” The produce management is so sloppy that “the newer among us are still working our way from recognition to acceptance, as if advancing through the stages of grief.” Much of her time in Walmart’s produce department is spent trimming rotted leaves (small bunches of lettuce have usually been trimmed many times) and “crisping,” a method of rehydrating limp greens so they appear to be fresh. A recent report issued by New York City’s Department of Health and Mental Hygiene suggests efforts may be working but there's more work to be done. "While the City has made strides in combating the nationwide trend of growing obesity, the majority of adult New Yorkers (nearly 57%) and two out of every five New York City elementary school children remain overweight or obese and the health consequences are dire” (January press release). Access to affordable, fresh, healthy food has increased tremendously in New York's poorest neighborhoods not only via more locally grown farm food, raised in community gardens or sold at farmers markets, but also from the efforts of the Department of Health and Mental Hygiene's initiatives such as the healthy bodega campaign to increase fruits and vegetables and reduced-fat milk and dairy stocked at corner markets; calorie posting in chain restaurants; Greencart branded fruit and vegetable stands in low income areas; and, Health Bucks, which provide a bonus coupon to farmers market shoppers who use food stamps. What will happen to the Harvest Home Farmers Market, the Grassroots Farmers Market, the Bushwick Farmers Market, and La Familia Verde and their 58 farmers markets that I wrote about last Spring? For the past decade, New York's Mayor Bloomberg and other elected officials have led the way to make NYC a healthier city and make the food system more sustainable and just, including creating incentives for supermarkets to open in "food deserts". Manhattan Borough President Scott Stringer, who has worked tirelessly to build a solid vision of a sustainable food system in NYC, has spearheaded farmers markets in Harlem and engaged dozens of food advocates in conferences and written several forward-thinking reports. His latest report tackles the effect of Wal-Mart’s expansion in just one uptown Manhattan location, "Food for Thought: A Case Study of Wal-Mart’s Impact on Harlem's Healthy Food Retail Landscape" (11/2011). Stringer recommends a pro-active stance by the City to bolster small food markets in "food deserts", and support urban agriculture and community food initiatives to ensure the survival of these important community food models. Stringer's food systems reports include: "Red Tape, Green Vegetables" (4/2011); "FoodNYC: A Blueprint for a Sustainable Food System (2/2010), which I had a hand in writing; and, "Food in the Public Interest" (2/2009). City Council Speaker Christine Quinn followed with FoodWorks (11/2010), a robust vision of NYC's food system that builds on Stringer's research and also includes dozens of policy proposals and recommendations. In the hundreds of pages of recommendations and proposals, neither Quinn nor Stringer suggest Wal-Mart is the solution. New York has become known nationally and internationally for its effort to overhaul the way food is grown, distributed, consumed and disposed of as the result of the work of government, anti-hunger, social justice and food advocacy non-profits, community leaders, chefs and eaters, writers and bloggers, as well as local, regional and national farms, fishermen, ranchers and businesses. Will we also be known as the City that kept Wal-Mart out? "Bringing Wal-Mart to NYC would not only damage local retailers and wage-earners, but would erode the great advances communities are making to increase access to affordable, fresh, healthy food." Jacquie Berger, Executive Director of Just Food, stated in Scott Stringer's press release . Is corporate giant Wal-Mart’s business model, which is to blanket a region with its stores, force its employees onto public assistance, and businesses to close, and predicted consequence, reduced access to healthy, affordable, fresh and locally grown food, something New Yorkers can afford even if Wal-Mart offers "everyday low prices"? I say “no”. While NYC's food system is admittedly extremely complicated and our "food deserts" are real and pose a long-term threat to the health of New Yorkers, many of them children, Wal-Mart is capitalism run amuck. They have a history of egregious behavior despite its impressive public relations machines and efforts to greenwash their offerings and ingratiate themselves on New York's real estate community, elected officials, locavores, food advocates and anti-hunger and other non-profits, some of which have benefited from Wal-Mart's $4 million donation to NYC in 2011. Food and Water Watch, a national organization, and local food and labor organizations say “no” too. Read Food and Water Watch's Press Release here. And, don't miss the 16-page report “Why Wal-Mart Can’t Fix the Food System”, which reads like a really well-written business school case study, here.